A gentle climb in the morning took us to New Meadows where we had a nice breakfast. The ride from here was a beautiful 50 mile roll down the Salmon river. 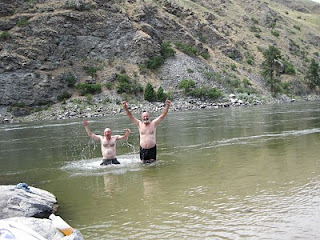 The temperature in the canyon was very hot so we stopped early and took advantage of the cool river. The escape out of Hells canyon was not near as bad as expected. Fresh legs and a cool morning climb made the 6 miles of 7+% go almost easy. I guess many things are that way - the anticipated challenge is worse than the actual event. C'est la Vie. Second breakfast was at Cambridge. From there we rolled through Council and up a hot steep grade that was difficult either because of the heat or possibly the two cans of beer and bottle of wine I was carrying for this evenings hydration. 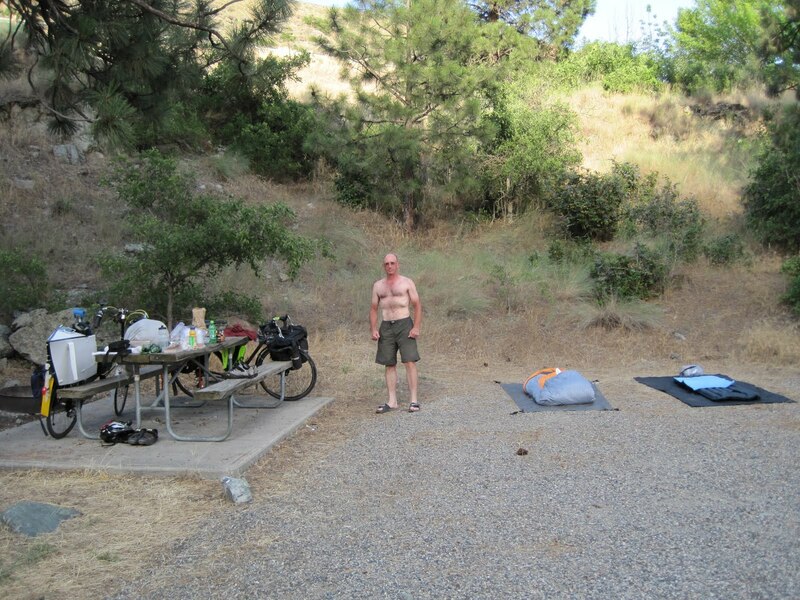 Evergreen campground on the Weiser river was our resting place this evening. Spanish rice with onion and salami. The climb from council was longer than anticipated so that our beers were warm. Today was was a short 65 which was very nice. The days ahead will have a number of shorter days though Lolo pass looms ahead. It was supposed to be an easy day. Somehow 107 miles in very high heat made the day more challenging than yesterdays 3 passes. Lack of sleep made Wayne grumpy because of the late night music and my waking him at 4:15 instead of 5:15. 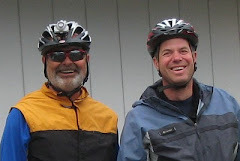 A quick downhill roll to a baker city truck stop and we were ready to descend down to Hells canyon. Ok so for some reason there were 2 summits to climb on the way down. The first was only about 400 feet and was barely noticed. The second one at the end of the day was 1600 feet at 7% which translates to just over 4 miles of hard climbing in very high heat. All to get to the bottom of the snake river canyon so we can climb over 3000 to get out tomorrow. Beans and rice with salami for dinner with a couple of cans of steel reserve. The sky is pink on the clouds above the canyon and its time for bed. Three 5000+ passes today and another 105 miles. We had breakfast in John Day and had concerns about the days passes to come. The climbs ended up not being so bad. 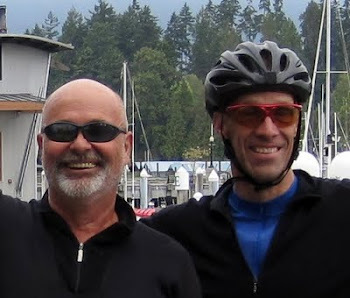 It turned out that our newly selected route is part of the cycle America cross country route that ends in Astoria. We chatted briefly with a Dutch couple headed for Denver. Towards the end of the day we rolled into the old gold mining town of Sumpter. A few miles further we arrived at an informal forest service camp site. No water so a dip in the lake was our bath again except for the loud music until 1 am when Wayne finally yelled out for some quiet it was ok. Well maybe not so ok since earlier I had found a tick crawling on my neck. Wayne assured me that there really shouldn't be many around this area. I still checked my clothing and self. The next morning a couple of miles down the road we passed a campground with shower, oh well. 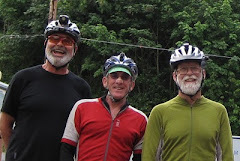 Two big climbs and 105 miles got us to to Mt Vernon just outside of John Day. We've rerouted ourselves through Baker city and hells canyon.